“Medicine, Ministry, Miracles: One Neurosurgeon’s Life” shares accounts of the author’s journey from being a devoted neurosurgeon to discovering a greater purpose with God. Spiritual healing is just as important as physical healing. Rev. Phillip Goldfedder, M.D. always dreamt of being able to help others. His autobiography narrates the story of how he became a successful neurosurgeon to fulfill that dream. He also shares the story of how he met his wife, Maureen, how they fell in love and started a family. He shares the great life he has with his family and friends and the privilege of helping those in need of his care. He also recounts the moment when his life took an unexpected turn and challenged his profession and soon changed his life. “Medicine, Ministry, Miracles: One Neurosurgeon’s Life” is an inspiring read about rising up from the darkest and most difficult moments in one’s life and discovering a greater purpose with God. He suffered from chronic intractable pain in his feet and never found a cure for it for three whole years. After being miraculously cured by Jesus through Pastor Benny Hinn during one of his miracle crusades, not only was he cured of his physical pain but he also found spiritual healing. From there, his own miracle led him to discover his greater purpose: dedicating his life to Christ and becoming a minister for spiritual healing. Through this, he was able to find a way to extend his desire to help others. In his book, “Medicine, Ministry, Miracles: One Neurosurgeon’s Life,” he reminds readers that spiritual healing through Jesus is accomplished only through the supernatural realm. “Medicine, Ministry, Miracles: One Neurosurgeon’s Life” is one of Dr. Goldfedder’s way of spreading his ministry and extending his insights on the power of spiritual healing. 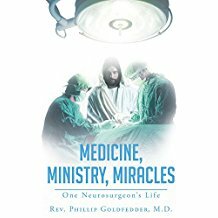 Find inspiration with his story by purchasing paperback copies of his book through Amazon: https://www.amazon.com/Medicine-Ministry-Miracles-Neurosurgeons-Life/dp/1640285180/.